December means winter. Not only because it officially starts on December 21st, but because it is usually cold, and snow has either fallen or is about to fall. The pianist George Winston had a beautiful album titled “December.” On the album he mystically captures the feeling of winter in the form of lovely piano music. If you haven’t listened to it, check it out; it’s quite beautiful. As a kid, I remember hoping and wishing for snow on Christmas. To me it wasn’t a perfect Christmas unless it snowed. If it didn’t snow it was usually just bleak and gray. If you can’t tell by that statement, I didn’t grow up in Colorado. I grew up in Ohio. December was always special. Yes because of Christmas, but also because it was the month of my birthday. My father and grandmother also had birthdays in December. December meant large family gatherings at my mom’s parents where I got to see all my aunts, uncles and cousins and share stories of what Santa had brought us for Christmas. It seemed like there was always something going on. December reminds me of sledding. 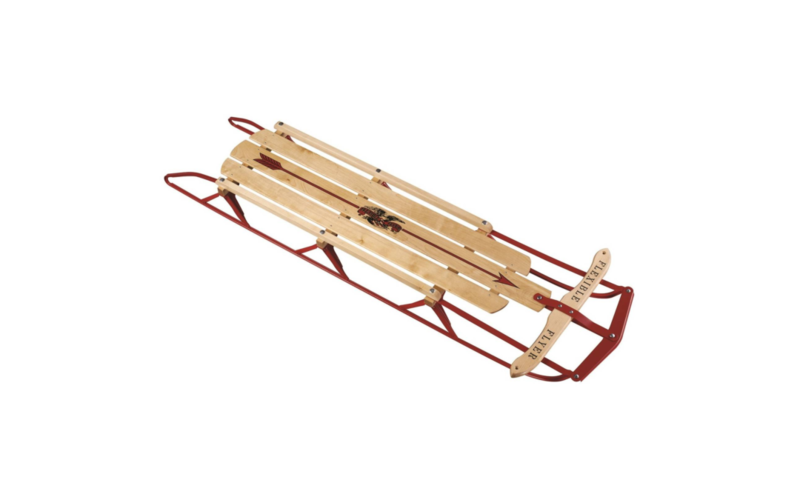 We had 2 types of sleds. The wooden type with metal runners that you steered from the front, and the round saucer types. After the first big snowfall, me and my neighbor, Jimmy Saxer, would head out to the local park to test the slopes. Up and down we’d go trudging along until we were too tired to walk up the hill anymore. Then we’d go home to thaw out hands and feet, so cold they hurt when you took your boots and gloves off. Going down was always great fun, but then it meant you had to walk back up to go down again. A no-pain, no-gain kind of thing. We didn’t think of it in those terms because we were just kids and the thrill of going down the hill and possibly crashing into each other was all that mattered. There was an old railroad pond just to the north of my childhood home. Winter also meant frozen water – thus a frozen pond. A frozen pond meant all kinds of wintertime excitement. Usually ice skating and hockey. Ice skating usually ruled the day and occasionally a hockey game would break out. We would race each other, play crack the whip, tag, you name it. Just about everything we did on land except in ice skates on the ice. We would also sled down the hill onto the ice. That was great fun too. If you’re trying to create your own December to remember and don’t have all the things you need to make your memories perfect, come see us at Grand Events. I’m sure we can help. Here’s hoping you have a wonderful December to remember.